You are here: Home / Uncategorized / Big News! I’m so excited to let you in on a little secret I’ve been working on behind the scenes! 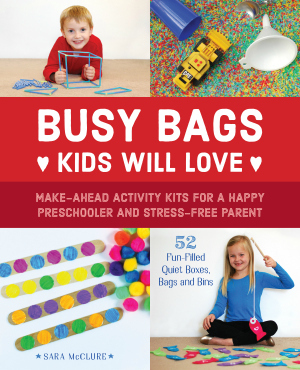 I was approached by a publishing company to write a book about hands-on busy bags that kids will love. I’ve accepted their offer and am frantically writing and photographing busy bags in between normal family life, including homeschool. The book will hopefully be available to purchase in all major bookstores and on Amazon in Spring 2017. So far, the writing and ideas have come very easily for me, most of the ideas were things I was planning on sharing here on the blog eventually. Now, they’ll just be in published book format. Also, instead of blogger on my list of credentials, I can include published author. Writing and photographing all of the busy bags myself is quite an undertaking, so posts here on the blog will be fewer until I meet my deadline in October…because I’m not superwoman no matter how hard I try to be. I’ll miss writing so frequently about our adventures in homeschooling, recipes, sharing free printables, and life in general, but it will be worth it in the end. I hope you’ll stick with me while I’m writing the book and will enjoy seeing me in your inbox again when I’m done writing it or get a chance to squeeze in a post here on the blog. Thank you, Phyllis! It’s pretty surreal to be writing a book! SO THRILLED for you, girl!! Thank you! It’s so surreal! And hard. Writing a book is hard.